I can't in good conscience enable any holiday gift knitters to not knit today, mostly because I myself have to knit today - and if I put too much thought into this post it will be too much like writing for me and way too much like reading, for you. 1/ I'm starting to crave ends to run in on heavy mohair-blend boot socks, just as I'm finishing off all the ends to run in. This sudden love affair with finishing seems ironic in some way that chocolate will probably explain later. 2/ This week I stumbled across the strangest reason for not knitting socks: because nobody will see them. 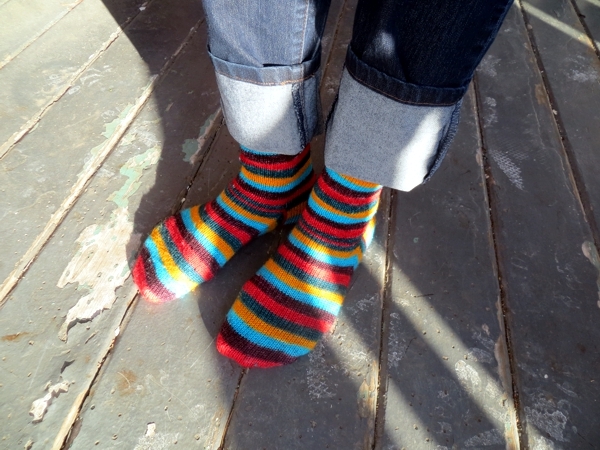 Hello, if you want people to see your handknit socks, then show them off! This is why miniskirts with footless tights were invented, not to mention jeans with the cuffs folded up. See? Trust the voice of experience: nobody will notice how stupid your jeans look. They only notice the socks. 4/ If you can't be knitting socks, it's helpful to remember that if you are knitting gifts instead, you don't have to go mall shopping. 5/ Antidote to mall shopping: The Purl Bee. I'm going to make you look that up because I can't risk going over there to get the link: they keep putting up cool last-minute decorating and gift ideas and it is killing me. 6/ Yesterday I remembered ordering knitting kits from Churchmouse Yarns and Teas that have not yet arrived, which means that when I finally finish the gift knits my mending tray will still be full. Of deliciousness. 7/ I discovered another feature of the Knitter's Mending Tray: it is warm. Yep, if you sit down in a comfy chair with the tray on your legs and then put your feet up - especially if you are wearing thick mohair-blend boot socks - you are going to be as cosy warm as if you had a nice soft blankie over you. Except you are being productive instead of dozing off. Bonus! 8/ Of course, I am not wearing thick mohair-blend boot socks while I work from the tray, because it's really important to wet block socks before you wear them. 9/ Instead I'm wearing midweight mohair-blend boot socks from last year, when I thought it wouldn't be a problem to leave a gap between the bottom of footless tights or folded up jeans and the top of the socks. Brrrr. 10/ Is it really that important to wet block socks before you wear them? 10+/ And also: can anybody recommend a good yarn for knitting summer weight socks? Okay, I'm outta here with my fingers mentally crossed for high levels of Getting Stuff Done. For me and for you! See you tomorrow and have a great day today. I wore my merino (blend) socks all summer...malabrigo, Vesper, Spring Tree Hill (unfortunately out of business)...Have you tried Berroco Comfort sock? It's nylon and acrylic and oh-so-very soft. It might work for summer. But my feet tend to be cold and I'm inside in AC most of the time...so it almost always feels like winter to me! ha! 1) I've never blocked my socks. Wondering what I'm missing . 2). I wear heavy alpaca socks all summer and I live in Oklahoma! Karen, I expect you're missing nothing except that extra bonus waiting time that makes the first wear just a little bit more of a relief ;^) Although I use Soak, which does soften things a bit, and with the mohair socks that is desirable. Alpaca in Oklahoma in July? Then I can definitely do wool in Boston in May!